Here at We ❤︎ Health Literacy Headquarters, we’re big fans of a team approach to creating great health communication products. Each member of the team — writers, designers, researchers, user experience wizards — brings their own skills, perspective, expertise, and approach. And as countless children’s television shows and popular board games teach us, teams need to work together and communicate well to be successful. One great tool to help teams communicate is sketching. That’s right, drawing with a pen and paper the old-fashioned way. This can be super helpful when it’s time for writers to hand off content to designers. The next time you’re ready to pass content to a designer, take a few minutes to visually capture anything that goes beyond the words. Working on a webpage? Sketch out where you think the images or call-out boxes should go. Writing content for an app? Draw how you envision the text fitting into the different screens. Sketching can do a lot more than you may think. Here’s why we ❤︎ it. Anyone can do it. You don’t need to be a design genius or know how to use a fancy wireframing program — just grab a pen and paper, and you’re off to the races! It’s fast and cheap. Fancy wireframing programs have their place — but often, they’re more than you need. With sketching, you can explore lots of potential ways to structure your content without sinking a ton of time into each one. It helps you see how your content will look. Ever spent hours crafting a brilliantly detailed intro paragraph before learning that there’s only space for 20 words? Sketching while writing helps you develop content within its visual context. Designers ❤︎︎ it. Obviously, designers are visual people. 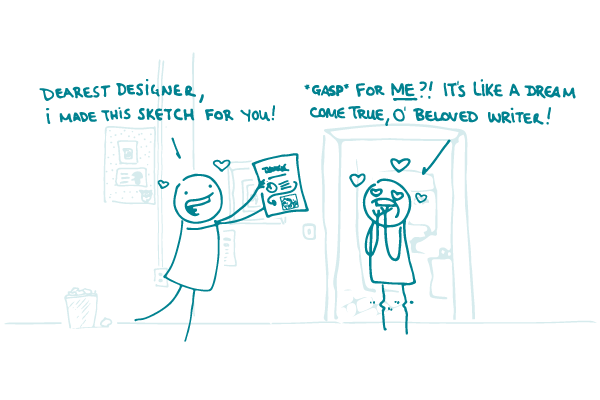 Instead of a document with paragraphs upon paragraphs of explanations, try giving them a sketch! “A stitch in time…” Sketching can help you and others on your team get on the same page quickly and avoid misunderstandings — saving everyone time, money, and frustration. The bottom line: Sketching is a great way to communicate visual ideas — and anyone can do it. What’s not to ❤︎?